The SVCam-EVO "Tracer" combines the outstanding features of the EVO series with the advantages of the Micro-Four-Thirds lens standard. By allowing full user control of zoom, focus and aperture, the lens becomes an integrated part of the camera. 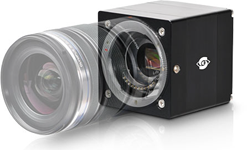 The Micro-4/3" lens system was pioneered by increasing demands in digital still photography. This standard, based on a bayonet mount, is widely used for compact cameras and is 100% optimized for digital image capture. There is a wide selection of suitable lenses, and more are on the way, making new and previously unthinkable solutions reality.